We’d love your help. Let us know what’s wrong with this preview of The Pleasing Hour by Lily King. To ask other readers questions about The Pleasing Hour, please sign up. While I found King's first effort well-written and compelling in the beginning, I was left disappointed and thoroughly annoyed by the time I finished it. The plot is uneven and rambling with many background stories of peripheral characters that are left incomplete and therefore frustratingly superfluous. Furthermore, even the main characters are never fully realized. We are given a rather complete history of Nicole, for example, her mother and childhood, only to be left with virtually no explana While I found King's first effort well-written and compelling in the beginning, I was left disappointed and thoroughly annoyed by the time I finished it. The plot is uneven and rambling with many background stories of peripheral characters that are left incomplete and therefore frustratingly superfluous. Furthermore, even the main characters are never fully realized. We are given a rather complete history of Nicole, for example, her mother and childhood, only to be left with virtually no explanation or resolution for her character in the present. For all it's direction toward "life's lessons", frankly there is little to be learned here by anyone, even the protagonist, Rosie, whom I wanted to root for, but who was drawn too morose and dull to permit me to. The dark tone, the dialogue jumping around to French and Spanish without translations, and the characters half-drawn and left hanging were all too much for me. Rosie goes to Paris to be an au pair. Her baggage includes a motherless childhood and a teen pregnancy deliberately and secretly planned in order to give her barren sister a much-desired child. Being an au pair in Paris follows the delivery of the baby and is designed to separate herself from the baby she cannot acknowledge. Rosie settles into her role as an au pair with the Tivot family, Nicole and Marc and their three children. We learn the history of each of the family members in great detail. Near the end of that year, the family takes a vacation to Spain and there Rosie shines in her ability to communicate in Spanish. It is there, however, that she has an affair with Marc Tivot – father, husband, and stereotypical Frenchman. During the year, Rosie receives letters, presumably from her sister, that she tucks away unopened. Some are so thick they are taped closed. At the end of the book (and the end of her year in Paris), Rosie decides it is time to read the letters. In those letters is the story, the untold story that should have been this book. After I read Euphoria I went in search of more of Lily King’s novels and happened on her first, The Pleasing Hour. I read about two thirds of it and put it down. It was a meandering novel that did not seem to know its business. It kept dropping characters I cared about to pick up on others I had no interest in. I still look forward to reading more of King’s work, as Euphoria was riveting. The kick-off premise of the book was a bit overdramatic for what it needed to be to launch such a story, but that was almost forgivable after all. The characters were finely sketched, if incompletely (and this seems to be on purpose). The unignorable "summer romance" thread of the narrative made this sit on this reader's tongue like a strange fusion of a Babysitter's Club Super Special meets something Literary. The true mastery of this book was creating a dastardly heroine that is pitiable becaus The kick-off premise of the book was a bit overdramatic for what it needed to be to launch such a story, but that was almost forgivable after all. The characters were finely sketched, if incompletely (and this seems to be on purpose). The unignorable "summer romance" thread of the narrative made this sit on this reader's tongue like a strange fusion of a Babysitter's Club Super Special meets something Literary. 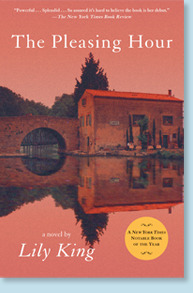 Many of my happy buttons were pushed early on in this novel: France through the eyes of an American! Quirks and struggles of learning/speaking French in France! Did I mention that I like reading about France and French ;-) While it carried me through quite swiftly in the first half, I found myself skimming parts of Rosie's internal diaglogue until the end. This book started out with an interesting plot and ended up being not pleasing. Lily King is a good writer, in how she describes people, scenery, action. However, this book as a whole needs help with character development and a focus to the story lines. The basic plot line is about a young woman, Rosie, who doesn't go to college but instead goes to France to be an au pair. Then she gets entangled with the father of the family (not an original theme). and leaves early to take care of the the elde This book started out with an interesting plot and ended up being not pleasing. Lily King is a good writer, in how she describes people, scenery, action. However, this book as a whole needs help with character development and a focus to the story lines. The basic plot line is about a young woman, Rosie, who doesn't go to college but instead goes to France to be an au pair. Then she gets entangled with the father of the family (not an original theme). and leaves early to take care of the the elderly guardian instead. There were aspects of the story that could have been more developed. For example, Rosie chooses to get pregnant while in high school so she can give that baby to her sister who is infertile. As soon as she gives the baby up she, unexpectedly, doesn't go to college but takes off to be an au pair in France. That's quite a story line there. She is, after all, postpartum. Only a brief description of how she felt holding the child, one paragraph about the boyfriend, some references to not being able to write to her sister. That's a loaded story right there. Rosie is in a new country, quite alone, literally and figuratively. No one knows about her pregnancy/baby/adoption. She's taking care of children and family. Does she have any further feelings about this life change? The mother of the family, Nicole, is a difficult personality. We get a clear (good writing) description of her behavior, her snobbiness, in the beginning. That is repeated too often without furthering the plot. There are repeated descriptions of Nicole's awkward husband and then furtive glances. There are some insights into the children, that, again, could have been developed. The young son who wanted to be a priest, the young teen daughter, the one daughter with whom Rosie feels some rapport. Those were three interesting characters though what did that all have to do with the story? The scenes with the elderly guardian were a way to explain Nicole's particular behaviours. That had (unrealized) potential. Not much more is explained about Rosie's time with the elderly woman. It was pretty disappointing that the climax, so to speak, of the story is a dalliance with the husband/father of the family. Rosie feels turmoil and must leave. Somehow it's arranged that she'll take care of the elderly guardian, without anyone saying more. This book will capture your soul, you will grit your teeth, lament...find the snug warm emotion only family can give you, trip on the unsuspecting trials of sexual identity, bask in the heady light of burgeoning love. This novel is a journey rather than a story, a layered gateaux of sweet longing, bitter regrets and the strange duties deep affection puts on the ego. Destination, after all, is often not a place but a feeling of belonging, a sense of achievement a niche you fit into. For every hea This book will capture your soul, you will grit your teeth, lament...find the snug warm emotion only family can give you, trip on the unsuspecting trials of sexual identity, bask in the heady light of burgeoning love. This novel is a journey rather than a story, a layered gateaux of sweet longing, bitter regrets and the strange duties deep affection puts on the ego. Destination, after all, is often not a place but a feeling of belonging, a sense of achievement a niche you fit into. For every heart that has yearned to resist inelegant temptation--here is the perfect recipe of understanding. King's writing is bursting with color and primed with passion, it sweeps you off your feet with its many convoluted evocative nuances. The simple story of Rosie, the au pair with a tragic past, has so many angles it's as if it's reflected from a prism. The concept of a young woman perhaps being lead by her nose into guilt, or perhaps creating her own guilt is explored with such subtlety that it comes a a surprise to realize that this is really the theme of the novel. This kind of writing is rare, this type of author a 'one-in-a-generation' species. Not since I first read John Fowles have I been so deeply affected by the written word. The questions posed (without giving the plot away) : Did they plan it, had they done it before? Beautifully written novel from the perspectives of several characters. The story centers around an American girl working as an au pair in Paris. Lovely, and just my kind of book -- a perfect fit for me. I'd highly recommend it. This novel has received rave reviews, but I found it rather uninteresting. A young woman becomes an au pair for a Parisian family to escape her past & ends up falling in love with the father (I guess; even that's not altogether clear). Potentially could have been great...found the story very choppy and underdeveloped. Left not fully understanding Nicole's history and the point of it all...so cold to Rosie at their first meeting and so trusting and friendly at the end, and not sure how that happened. Well-paced, bittersweet novel about a young American woman working as an au pair in France for the year. This is as about as good as book can get. It's simply told yet every moment is packed with such information both of the character, their relationships to others and their surroundings that you only end up reading a couple of pages at a time. You need to let the moments King creates sink in. It is ostensibly the story of Rosie, whose mother died before she was a year old. She has a baby that she leaves with her sister (the story behind that is fodder for a whole other complete novel) and escapes t This is as about as good as book can get. It's simply told yet every moment is packed with such information both of the character, their relationships to others and their surroundings that you only end up reading a couple of pages at a time. You need to let the moments King creates sink in. It is ostensibly the story of Rosie, whose mother died before she was a year old. She has a baby that she leaves with her sister (the story behind that is fodder for a whole other complete novel) and escapes to France to nanny for a family who live on a houseboat. She immediately is put off by the matriarch Nicole, who is sleek and cool and very sophisticated while warming to her husband a tall, gawky yet somehow handsome doctor. She tries to keep emotional distance from the family as she will only be there a year but that turns out to be impossible. Each character whether primary or secondary are imbued with a history and such life it's as if you are there with them, in their head, feeling their feels. It's what the best literature does. Rosie is a flawed but intractable heroine learning self-esteem and her effect on others and whether she wants to affect others or not. With Nicole, you become privy to a tragic past that explains her emotional precision and perceived coldness. Ultimately, the story is about mothers. Mothers lost and mothers to be and the need to mother and be mothered. I wish I could give this novel more than 5 stars. I am discouraged from writing anything myself for fear that it will never measure up to such fine work but I'm inspired too, to try. I met Lily King and she inscribed this book, her debut novel, for me. I recently listened to Euphoria, her latest, and wasn't struck the same way as I was with this one. I wish I could meet with her again after reading The Pleasing Hour; I had unfortunately not read her before the presentation I attended. Besides an I wish I could give this novel more than 5 stars. I am discouraged from writing anything myself for fear that it will never measure up to such fine work but I'm inspired too, to try. I met Lily King and she inscribed this book, her debut novel, for me. I recently listened to Euphoria, her latest, and wasn't struck the same way as I was with this one. I wish I could meet with her again after reading The Pleasing Hour; I had unfortunately not read her before the presentation I attended. Besides an intricate story woven beautifully with language, her characters are so well defined and richly thoughtful in their portrayal. I appreciate Ms. Kings attention to the people in her novels and their relationship to each other as well as to their innermost thoughts which are just so raw and true; she doesn't waste a lot of time describing the scenery. She gets right down to it. I like that. Fabulous! Accurately captures the abject loneliness of being an au pair in a country where you don't speak the language and you have no friends. Character portraits are excellent, setting descriptions are short but exquisitely detailed. You can feel the weather, the barge, see the vineyards, the lavender. Even though its partly a coming of age story, its so much more. An "adult" book. I was disappointed in this book. I have loved Euphoria and another of her books, but this one I couldn’t get into. I couldn’t connect with the main character and why she was so detached, why she made the decisions she did. I also couldn’t get into her French family. I thought the flashbacks were interesting but then nothing was really done with them. Euphoria is still one of my favorites. An American in Paris. But not as it sounds. Rosie becomes an au pair in Paris, escaping her recent struggles. The children's mother is an enigma to her, which she wants to figure out. A different, but engaging read. A trash fire. How Lily King progressed from this book (a disaster) to Father of the Rain (excellent) is a mystery to me. There isn't a point here, nothing really happens and the book crawls to the finish line. I see that this book about a young American woman who goes to nanny for a family in Paris has not received the best reviews, but I thought it was beautifully written. Personally, I liked it better than Euphoria but I'm guessing this one will not be everyone's cup of tea! More like 3.5 stars being the author's first novel. A good story and good writing. The story deals with the struggle of 19 years old Rosie searching for love is touching, however the novel doesn't live up to the author's more recent work. Odd book. Story of American nanny in France. Complicated life of the nanny and her French family. I never really enjoyed a single minute of this book, yet I kept reading it to the end. King treads familiar domestic territory here, but her prose is so achingly gorgeous, her insights so sharp, and her technique so good that I found this book difficult to put down. The intersection of many different unfulfilled lives when an American teen flees to France to become an au pair. Interesting look at many different points of view as the year unfolds. 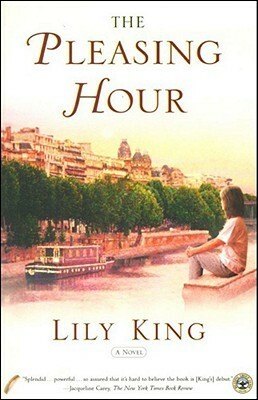 Lily’s first novel, The Pleasing Hour (1999) won the Barnes and Noble Discover Award and was a New York Times Notable Book and an alternate for the PEN/Hemingway Award. Her second, The English Teacher, was a Publishers Weekly Top Ten Book of the Year, a Chicago Tribune Best Book of the Year, and the winner of the Maine Fiction Award. Her third novel, Father of the Rain (2010), was a New York Times Editors Choice, a Publishers Weekly Best Novel of the Year and winner of both the New England Book Award for Fiction and the Maine Fiction Award. Lily is the recipient of a MacDowell Fellowship and a Whiting Writer's Award. 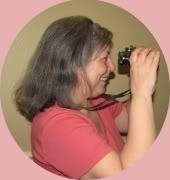 Her short fiction has appeared in literary magazines including Ploughshares and Glimmer Train, as well as in several anthologies.